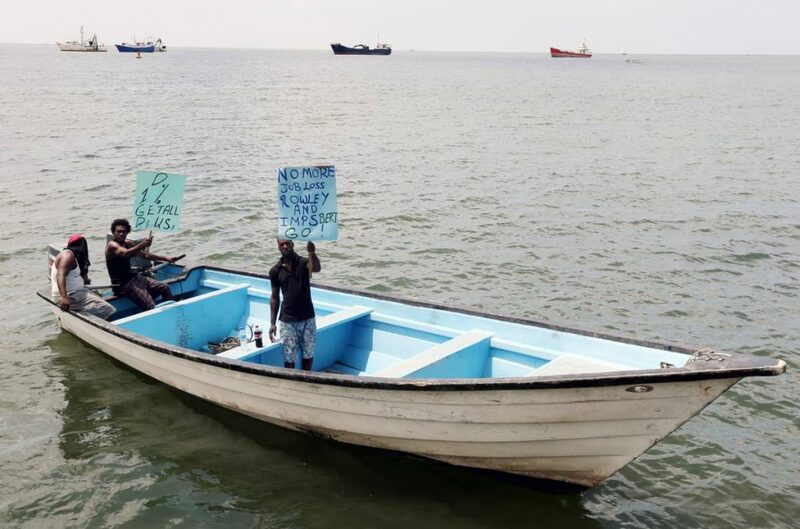 The chorus of condemnation over the 2018 budget reached the high seas as fishermen in a pirogue, waved placards in protest over the hike in the price of fuel, especially diesel which fishermen use to power their boat engines. 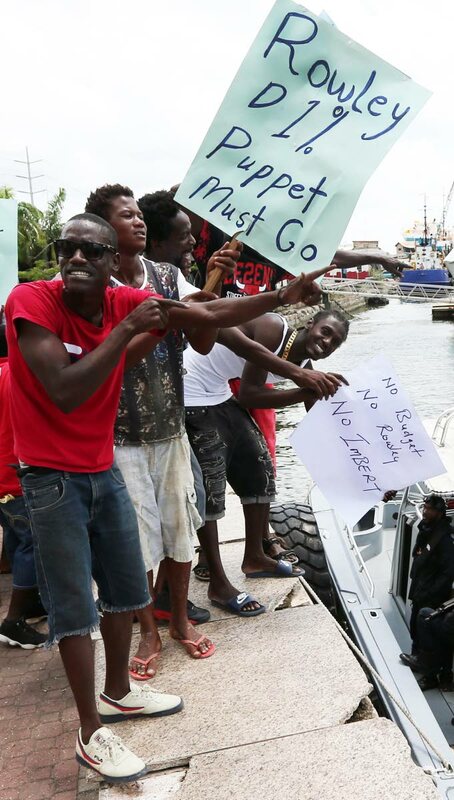 The pirogue sailed up to the International Waterfront Centre and the fishermen disembarked and joined with dozens of their comrades who were already engaged in a protest near the Parliament where on Monday, Finance Minister Colm Imbert announced the rise in the price of diesel and super gas. Protestor Robert Ramsingh said the increase in fuel prices could spell the death of the local fishing industry as many fishermenm, faced with increased costs for fuel, reduced catch and low sales, could be motivated to abandon their trade and seek easier means of earning a dollar. “It is not easy being a fishermen facing pirates, facing bad weather and now having to dig deeper just to buy diesel to power the boats,” he said. He called on Minister Imbert and Minister of Agriculture, Land and Fisheries Clarence Rambharat to meet with fisherfolk to come up with a plan to mitigate the exhorbitent cost of fuel. “This is not going to work out. This is the second increase in the price of fuel in four years. We did not protest the first time, but we have to put our foot down now and to the government, ‘enough is enough’, they must consider the impact the increase in fuel will have in our ability to earn a livelihood from fishing,” Ramsingh said. He said no consultation was held with the fishermen and other groups of fuel consumers such as maxi taxi drivers prior to the announcement of the rise in fuel. Ramsingh said affecting the fisherfolks’ ability to fish could directly contribute to the burgeoning billion-dollar food import bill as consumers, faced with a shortage of fresh fish, will turn to imported seafood products. President of the National Trade Union Centre (NATUC) Michael Annisette met with the fishermen and expressed support for their action saying that until people start telling this government how they feel about policies including taxation and price hikes, nothing will change. He said government has an obligation to all citizens and increased taxation is not the solution to the economic downturn. He urged Imbert to meet with the fisherfolk. Police and Coast Guard Officials were on hand to maintain law and order. Reply to "Prepare for fish shortage as fishermen protest diesel rise"